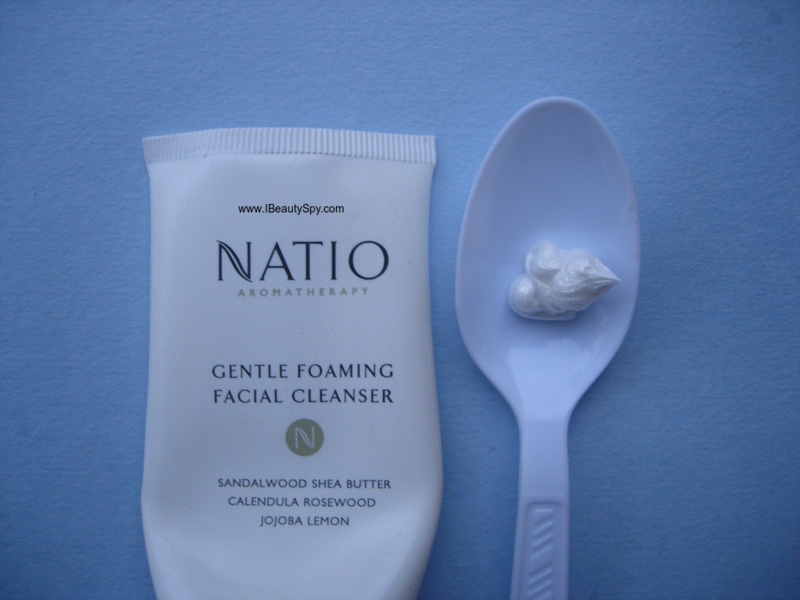 Today’s post is all about Natio Aromatherapy Gentle Foaming Facial Cleanser. Natio is an Australian beauty brand offering natural, plant-based, aromatherapy skincare and makeup products. Natio entered India recently and their products are available on Nykaa and other shopping portals. As I was looking through Nykaa for a good face wash for winters, I came across this Natio Aromatherapy Gentle Foaming Facial Cleanser. What attracted me most was the aromatherapy claim. Am a strong believer in aromatherapy and essential oils. A face wash containing a blend of essential oils sounds nice and I added it to my cart. Let’s see how Natio Aromatherapy Gentle Foaming Facial Cleanser fared on me. A light and efficient soap-free cleanser with a neutral pH to purify the skin while maintaining correct moisture balance. Extra low foaming agents avoid stripping the skin of vital natural moisture. Effectively removes excess surface oils, impurities and make-up. Leaves skin feeling pure, relaxed and softly moist. Contains pure essential oils to help neutralise the drying effects of hard water. Water, Stearic Acid, Propylene Glycol, Glycerin, PEG-7 Glyceryl Cocoate, Calendula Officinalis Flower Extract, Jojoba seed oil, shea butter fruit, rosewood oil, sandalwood oil, lemon peel oil, fragrance, carbomer, phenoxyethanol, methylparaben, propylparaben, Disodium EDTA, Potassium Hydroxide. I bought this face wash from Nykaa when there was an offer. I bought a combo of this face wash and moisturizer and got a face pack free with it 😀. The packaging looks simple, elegant, clean, minimalistic and luxurious. 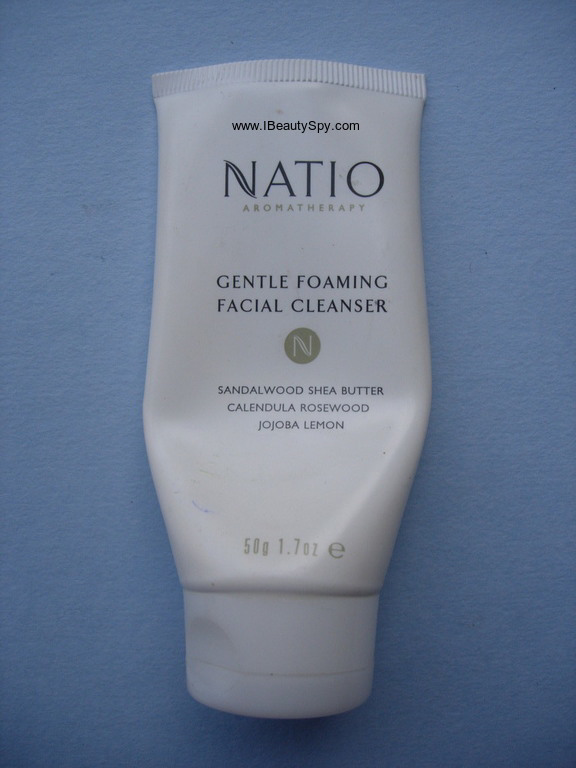 Natio Aromatherapy Gentle Foaming Facial Cleanser has a cream based consistency which is not too thick nor too runny. It has a very mild soothing fragrance, almost negligible I would say. If you are looking for fragrance free products, you can give this a try. Natio Aromatherapy Gentle Foaming Facial Cleanser spreads easily on the skin and lathers little with water. Since its free from sulphates, there is not much lather. It is very gentle on the skin and would suit sensitive skin people well. Whenever my skin is irritated or sun burnt, I use this as it gives a soothing sense to the skin due to the presence of aroma essential oils. The face wash does not strip the skin of its natural oils, yet it cleans the skin thoroughly. After washing, my face feels clean, soft and supple. With regular use, I can find a soft glow on my face. I feel this would be a good anti-aging face wash for those in late twenties who are just starting on an anti-aging routine. 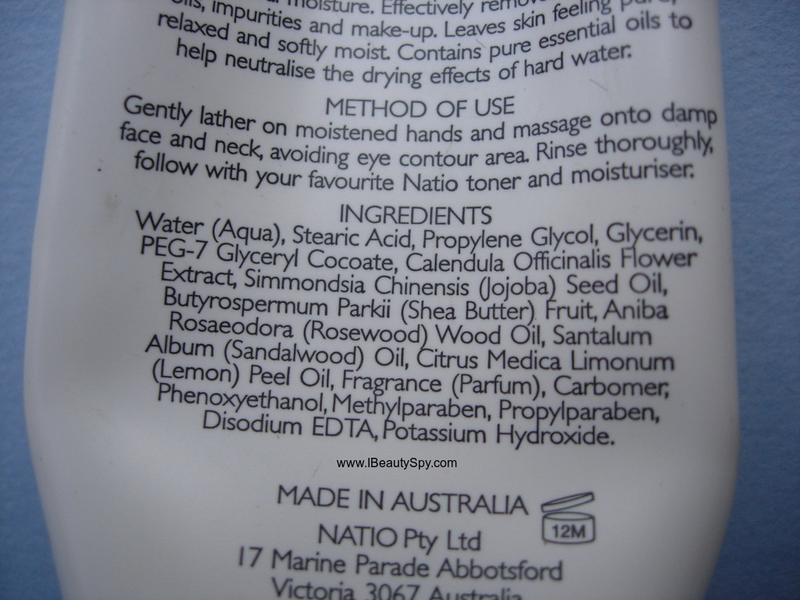 What impresses me most is the ingredients list which contains sandalwood, shea butter, calendula, rosewood, jojoba and lemon. It feels good to treat your skin to the goodness of so many natural, beneficial ingredients. The first ingredient is stearic acid which is a fatty acid meant for thickening the product. Next is propylene glycol which acts as a humectant and help in hydrating the skin. We all know the benefits of glycerin which is an excellent moisturizer. It is used in face washes to retain the moisture of skin without making it too dry. PEG-7 Glyceryl Cocoate is an oil-in-water emulsifier. After these come the main ingredients. Calendula Officinalis Flower Extract has antiseptic and antimicrobial properties which help to calm down inflammations and sunburns. Jojoba oil and shea butter both help to nourish the skin from deep within. Rosewood oil is an anti-ageing oil which rejuvenates the skin and keeps it looking young and healthy. Sandalwood and lemon peel oil helps to clarify and brighten skin. * Gentle cleanser suitable for dry, sensitive skin. * Makes skin clean, soft and supple. * Gives a soft glow with regular use. * Contains essential oils blends of sandalwood, shea butter, calendula, rosewood, jojoba and lemon. * Can be an excellent anti-aging face wash.
* Elegant, clean, luxurious packaging. I would recommend this face wash for all skin types in winter. Dry and sensitive skin people can use all throughout the year. This is also a good anti-aging face wash. I was actually thinking of repurchasing, but currently I have a lot of face washes to finish up. So I might purchase some time later. I find it little pricey, but usually aromatherapy products are expensive. Considering that and its sulphates-free and contain blend of many essential oils, I would say its worth the price. I totally loved using this pure, aromatherapy based face wash. If you are looking to treat your skin with pure, natural, plant based ingredients, I would highly recommend Natio Aromatherapy Gentle Foaming Facial Cleanser. Its purity at its best! I find this to be expensive for a face cleanser. Nice review. 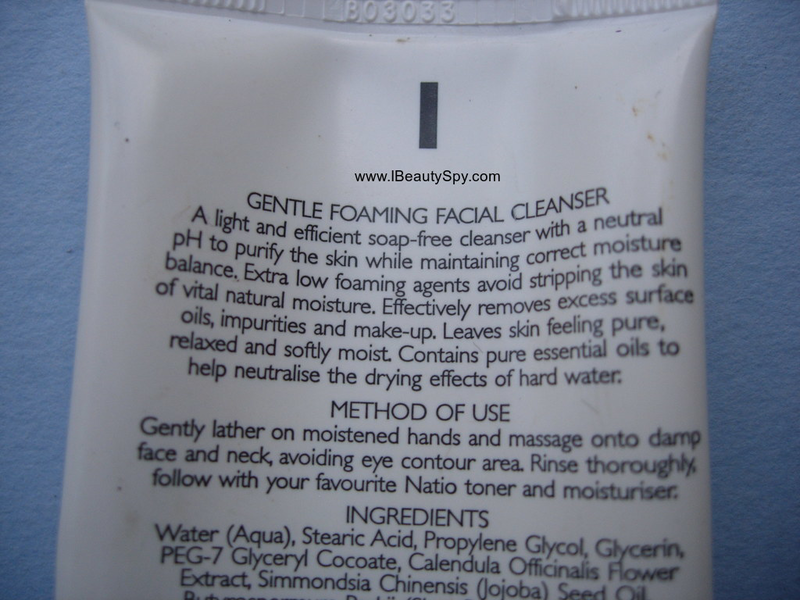 I’ve used this face wash and I love how gentle it is. It cleansed the skin without drying it out and didn’t irritate my sensitive skin either. Hey thanks for sharing this review dear, I would definitely purchase this face cleanser, it sounds awesome <3 🙂 Lovely review. It seems to be good product. But yes, it’s pricey.